I own the inductorless version of this. 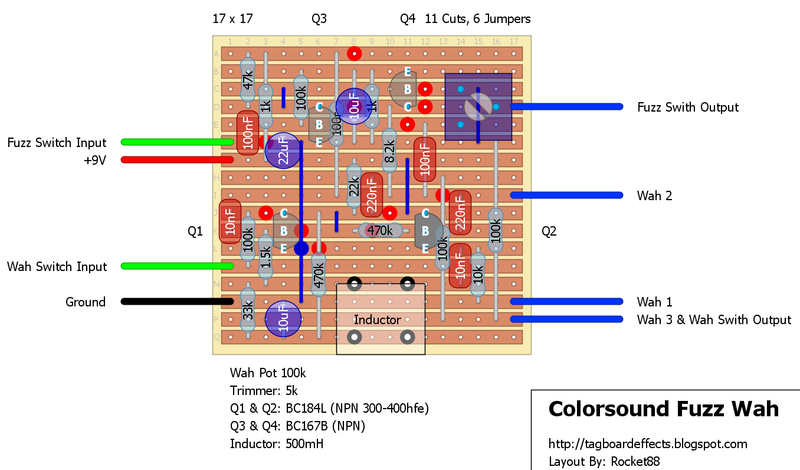 i didn't know that there was an inductorless fuzz wah, all the ones i know about are all traditional inductor wahs. if you've got or can take some gutshots i'ld love to take a look at it. I have an old wah shell that needs this! Any way to just build the fuzz section of this? 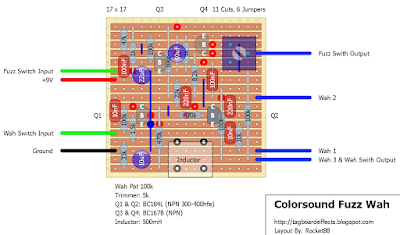 I haven't tried thoroughly checked this but of course I have the Fuzz Face schematic burned into my brain forever lol so it looks like there's a cut missing between input and Q2. damn man, can't believe i did that. fixed it, and should be good to go now. Fixed this up and works nicely. 4123 and 4124 for the fuzz, BC108s for the wah. I was getting some oscillation and tried all sorts to fix it (swapped out the transistors, used a trimmer instead of the 1k resistor on Q4's emitter, shielded wires etc). It then dawned on me that most of the issues with wah and fuzz stem from the old debate about their order. Any suggestions for a housing for this? I've got an original enclosure that was gutted some time before it came into my possession. The sweep of the treadle is wider than a Cry Baby so I'm not sure you'd get the same range. Worth a shot though if you have an old wah enclosure to hand.